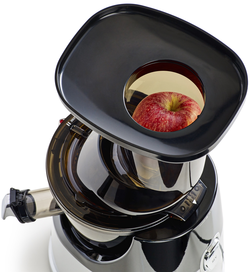 Omega Mega Mouth Slow Juicer MMV700S- Cold Press Slow Juicer with 3" wide feed chute. 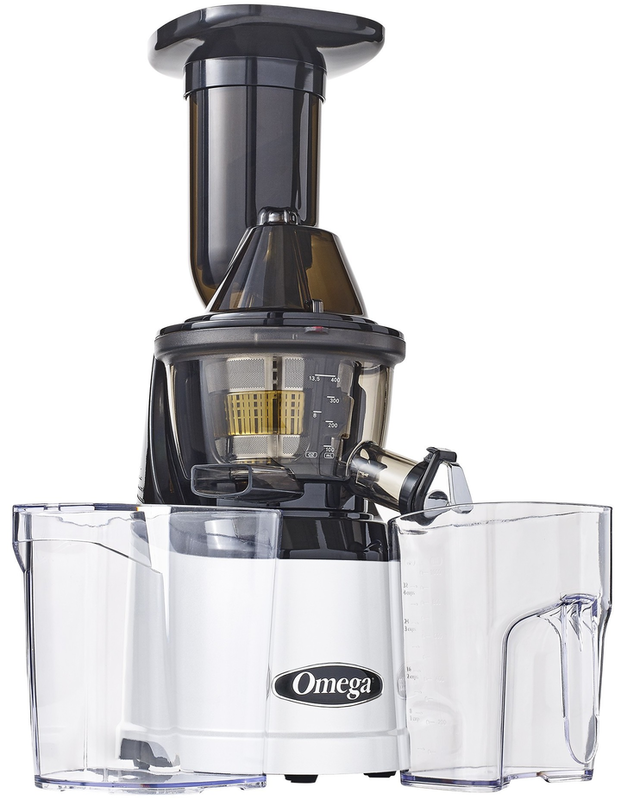 The all-new Omega Mega Mouth Slow Juicer MMV700S is Omega's first 3 inch wide feed chute slow juicer. 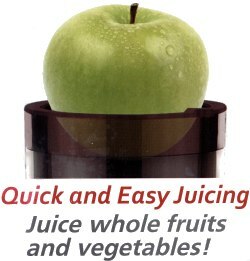 The Omega Mega Mouth Slow Juicer is the original cold press juicer with a 3 inch diameter feed chute to make juicing faster and more convenient. This cold-press juicer runs at 60 revolutions per minute to gently extract vitamins, minerals and phytochemicals from fresh fruits and vegetables. 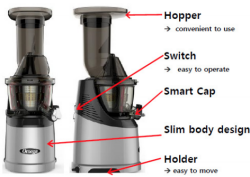 The all-new MMV700 model can be up to 12% more efficient than original 3 inch feed chute juicers. 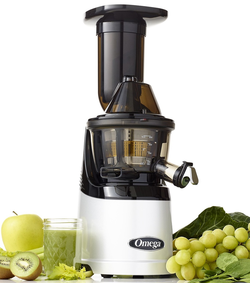 This juicers create a rich, full-bodied juice that contains more pulp than Omega's VSJ843 model. Upgraded Juicing Screw & Juicing Bowl. 3 inch -wide feeding tube accommodating whole ingredients. 3 in 1 Multi Juicer (Juicer, Sorbet Maker, Smoothie Maker). Clean and convenient Smart Cap. A rotating cleaning brush for easier cleaning. Cooling system to prevent overheating. Unlike the existing screw, the deep hole at the bottom reduces pulp in the extract and makes more juice. The new screw not only strongly squeezes whole ingredients but discharges pulp in the drum smoothly in order to increase the amount of juice. 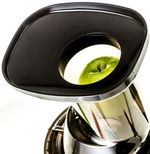 The all-in-one bottom of the Juicing Bowl enables easier cleaning and assembling. You don�t need to separate silicone rings or open press silicone for cleaning anymore; it also prevents juice leaking when not fit completely. With the included sorbet attachment, you and your family will be enjoying frozen-yogurt consistency 100% fruit sorbets with no added sugars, flavors, or preservatives. 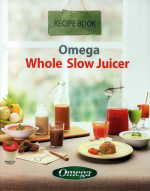 This is the only Omega Juicer that includes a dedicated full-color recipe book with dozens of juice recipes as well as other recipes you can make using the Omega Mega Mouth Slow Juicer. It contains 75+ full color pages of bright pictures and recipes to help you get on the road to better health. The Omega MMV700 includes a handy funnel. This funnel allows you to more easily feed smaller produce items like chopped vegetables or cherry tomatoes or grapes into your juicer without spilling. The wider feeding tube, enough to accommodate an entire apple, makes extraction simpler and more convenient. It also minimizes loss of natural color, taste and nutrients of ingredients by reducing exposure to the air. 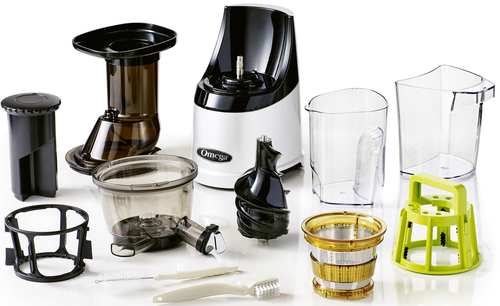 The product can be widely used for making juice as well as ice cream and smoothies (with optional accessory). Replace the juice strainer with an blank strainer for ice cream, and with the optional smoothie strainer for soft smoothies. Translucent hopper enables one to see an entire apple being juiced. You will instantly be able to tell if produce is jamming the feed chute, in which case, the pusher should be used. The smoothie strainer allows you to mix your favorite frozen fruits and beverages to make low oxidation smoothies. Use with steamed vegetables to make pureed baby food.